Moor Green Lane in Moseley. 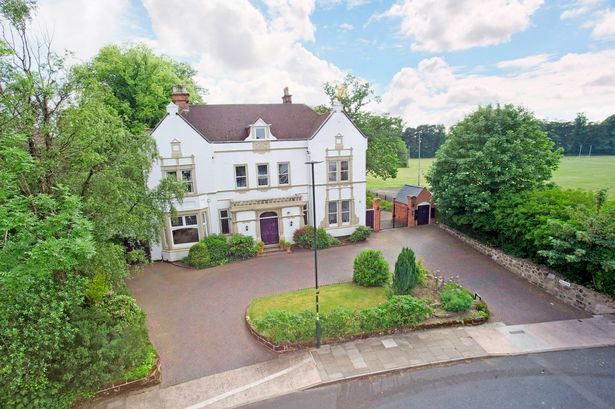 This handsome Victorian property in Moseley is a “sweet deal”. It is believed to have been built by members of the Cadbury family back in the late 1800s. It should certainly appeal to both wine collectors and drinkers as the basement has been transformed into a wine cellar where bottles can be stored and a snug area where they can be drunk. The double fronted property is beautifully presented and benefits from clever modernisation. Yet it still maintains its character with stained glass leaded windows, deep ceiling cornicing, ceiling roses and deep skirting boards. Located on Moor Green Lane, the house has a newly paved in and out driveway with off road parking for a number of cars. There is a shaped lawn and rockery beds behind a stone retaining wall. Above the double front doors is an ornate stained leaded light and carved stone portico. Inside the entrance vestibule has Travertine flooring. There is more to be found in the reception hall which has a magnificent carved staircase to the first floor with original spindle balustrade and panelling below. A part glazed panelled door with stained glass leaded inset and top light gives access to the back garden. There is a deep walk-in cloakroom with storage space. On the opposite side of the entrance is a guest cloakroom with toilet and basin. Across the hallway from the drawing/sitting room is a dining room with deep square walk-in bay window to the back with stained glass leaded top lights and half glazed panelled doors to the garden. A wooden fireplace has a high mantle, lower display mantle, arched cast iron inset and grate with raised quarry tiled hearth. A door connects to the kitchen. An inner hallway boasts a beautiful Travertine floor, stained glass leaded window, display recess and additional staircase to the first floor. There is access to a deep storage cupboard, a panelled door to the cellar and doors to the utility and kitchen. The utility has storage units and work surfaces, wall units, a deep storage cupboard, space for a fridge freezer and washing machine, ceramic tiling to the floor and to splashback areas. The kitchen/diner has been impressively refurbished with base, drawer and wall units, open display units, central island and deep storage cupboards. The units have beech block work surfaces. There is a Belfast sink, Baumatic oven with five ring gas hob and extractor fan in a stainless steel chimney style canopy over, dishwasher and integrated fridge behind matching panelled doors, stone tiled splash backs and ceramic tiled floor. Windows to the side enjoy views over Moor Green Playing Fields. An open access leads to the spacious dining area with ceramic tiled floor, inset skylight and walk-in bay window. On the first floor there is a split level landing reached from both staircases. It has three sash windows to the front and three centre ceiling roses. Storage is offered in the walk-in airing cupboard. The master suite has a pine fireplace and mantle with cast iron inset and grate with quarry tiled hearth. An en suite bathroom has a freestanding roll top bath on ball and claw feet, square pedestal basin, toilet and fully tiled shower cubicle. Bedroom two has a cast iron fireplace and mantle and panelled door to the en suite bathroom. This is fitted with a freestanding roll top bath on ball and claw feet, square pedestal basin, toilet, shaped shower cubicle and a deep walk-in storage cupboard. In the third bedroom there are two shelved display recesses and a pine fireplace with mantle and cast iron inset. In the family bathroom there is a white suite with a bath, tiled shower cubicle, square pedestal basin and toilet. On the second floor there is another split level landing with sloping ceiling to the front. There are four more bedrooms here, all with sloping ceilings. Two have exposed beams, two have dormer windows and there are also two Velux windows. Bedroom six has a pine fire surround and mantle with cast iron inset and grate and quarry tiled hearth. There is also a bathroom on this level with panelled bath and shower over, square pedestal basin and toilet. A shower room has a fully tiled shower cubicle, square pedestal basin and toilet, and open access to a walk-in storage area. Outside there is access to a garage. There is a walled back garden with a stone flagged patio area extending to a shaped lawned rear garden with mature trees, side borders with a wealth of shrubs and flowering plants. There is also a side store/workshop. Moseley is two miles from the city centre. The boho suburb/village is a popular nightlife and leisure destination thanks to its many pubs and restaurants. It has number of independent retailers and small boutiques. It is famous for its links to JRR Tolkien who spent his early years there. Moseley is also very sports orientated with a rugby ground and cricket club.